A cool feature on computers that is overlooked is the ability to share folders on our computer to others on the same WiFi network! It is easy to set up, and makes for fast file-finding for other family members! No more USB thumb drives to move files back and forth! This is used for at home use only. After the dialog box opens, you can create a name that other people who access that folder will see, and you can also set permissions for who can and cannot use the folder. 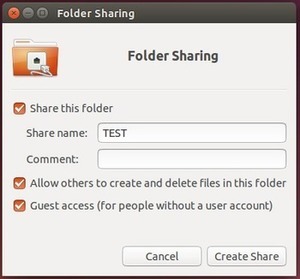 (For a more in-depth and advanced folder sharing tutorial, see Samba Shares) When you are ready to share the folder, click the ‘Create Share’ button! This tool has many applications! For my personal use, I refurbished an old clunky laptop my family had lying around not in use, hooked it up to our WiFi, and created a local server for our house! Now our family has a backup of all our files! They can access the server through shared folders and store information there! This entry was posted in Customization, Hardware. Bookmark the permalink.